3 shops were looted on Deshmukh road on early hours of Thursday July 9. 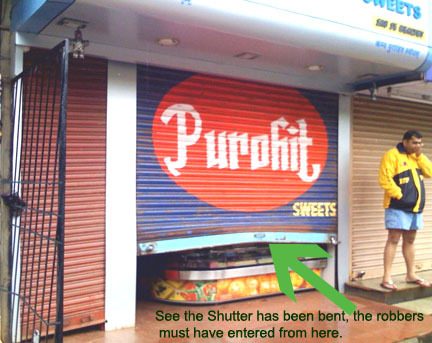 One Kirana shop, one hair cutting saloon and Camp Purohit sweet shop were looted by robbers. What the robbers took from the hair cutting saloon was not known but cash around 15 thousand and foreign chocolates were looted from Purohit sweet shop. The Police station is just 2 streets away but still the loot happened and still nothing is known about it. Recently the police authorities said that the media should always not show the bad side of the police but show the good side as well. But we hardly get a chance for the latter, do we.